Cheese & Kebab FondueServe these up at a BBQ party and you'll go down in the books as BBQ royalty! These parcels of melted steak and cheese heaven can be made ahead of time and brought to any BBQ party or picnic. Let’s not lie to ourselves, most of us have spent our fair share of time by the chocolate fountain at buffets, and there’s no denying that the prospect of fondue is part of the reason why we went in the first place… Well it’s time to bring fondue to BBQ! 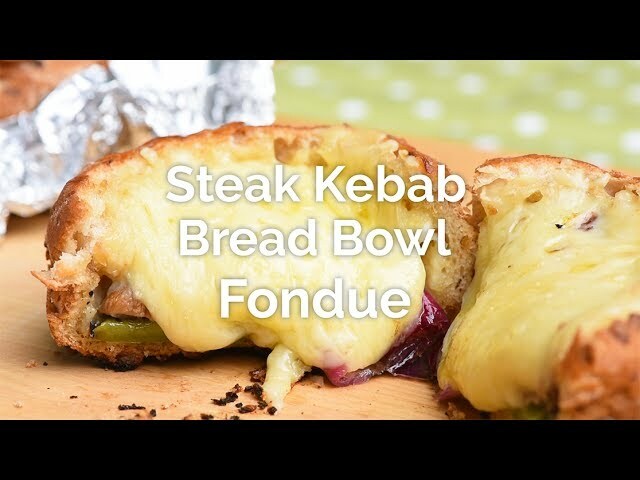 Our recipe for BBQ kebabs with bread fondue bowls will make you melt too!.. It gets better, after you’ve finished with the cheese and kebab, it’s time to tackle the bread bowls, which by that time will have soaked up some of the cheese and oils from the kebab, making it soft and gooey. We’ve made this recipe super easy so you can prepare ahead in the kitchen and put together really easily at the BBQ. Perfect for Picnics and parties. Wash vegetables and cut (except the mushrooms) into bite sized pieces and Cut meat into chunks. grill skewers for about 15 minutes, turning every 5 minutes, until meat is cooked to your desired doneness.